Verizon subscribers with Android smartphones can now lump their usual carrier services and Google Play app purchases together on a single bill. The new addition, which was rumored earlier and then confirmed, reportedly went live as early as yesterday for some users. Carrier billing has been available for T-Mobile, Sprint and AT&T customers for some time now. 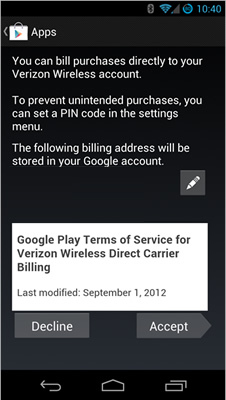 To take advantage of the unified carrier billing feature, Verizon customers need only to select "Bill My Verizon Wireless Account" during checkout while purchasing apps from the Google Play market. The option will appear automagically for all upgraded subscribers, as there aren't any hoops to jump through like hidden settings or apps to download. If you'd rather not have app purchases show up on your Verizon bill, subscribers do have a way to opt-out. To disable the carrier billing feature, Verizon customers can visit this page. Click Service Blocks > Add > Block Web Purchases. That should be it. While many users won't have much use for unified carrier billing, one possible usage case is subscribers without credit cards. Google Play only accepts electronic forms of payment compatible with Google Wallet (i.e. debit cards, credit cards, Google Checkout and Google Play gift cards), so having another way to pay should help Google reach this specific demographic. To help combat abuse -- and possibly bill shock -- Google enforces a monthly spending limit of $25 for carrier-billed purchases. Purchases beyond $25 can be made using traditional payments.